Indian festivals are incomplete without our traditional desserts like Kheer. Rice kheer is every home delight. Give a chocolaty twist to this Indian dessert by serving Kheer in chocolate made shots. It will be divine for kids 2 in 1 combo, Kheer and chocolate together. 1. Pour milk in a heavy bottom pan/ kadai. Add cooked rice and cook on medium flame till milk thickens. Because cooked rice is added, therefore it will take less time to cook. Keep on stirring the kheer in between to avoid sticking at the sides and base of the kadai. 2. Once milk thickens, add sugar and cook for another 10 min. Once ready, keep aside for cooling. 3. For chocolate shots - melt dark compound in a microwave. Take a small disposable glass and put a slit at edge. Pour the melted chocolate inside the glass and coat it completely. Take out the extra chocolate. Keep this cup in freezer for about 5 min till it sets. Once set, tear away the cup carefully. Chocolate shot is ready. 4. 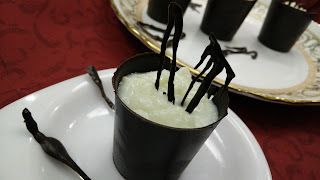 Pour the cooled kheer in chocolate shots and garnish with chocolate savings. Serve cold.